You may not want a robot landing the 737 you’re a passenger on, but DARPA is celebrating the fact that its Aircrew Labor In-Cockpit Automation System (ALIAS) landing the aircraft. 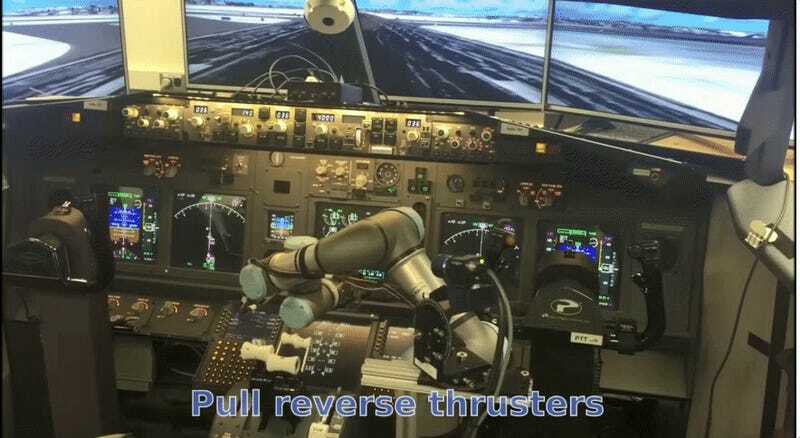 In a YouTube video posted Tuesday, a robot is seen taking instruction on how to land the 737 in a simulator. By the looks of the video, the landing looks smooth. The purpose of the program is designed to take over for the human pilot in the event he or she is incapacitated. Of course, we do not know how the robot would respond to inclement weather or turbulence, but a robot landing a 737 is a big step up from flying a Cessna Caravan. It’s designed as a drop-in avionics and mechanics package that can be quickly and cheaply fitted to a wide variety of fixed and rotor aircraft, from a Cessna to a B-52. Once installed, ALIAS is able to analyze the aircraft and adapt itself to the job of second-pilot. Along with the robotic arm, the ALIAS system incorporates an advanced tablet-based user interface, speech recognition and machine learning. Alternative versions will drop the robotic arm and provide support to the pilot by tracking the aircraft’s physical, procedural, and mission state. The idea is that, once ALIAS is fully developed it will be able to familiarize itself the aircraft within a month and take over many of the pilot’s functions, allowing them to concentrate on higher level decisions and not be distracted during emergencies. In addition, it will allow for smaller crews with a subsequent drop in operating costs. But don’t worry. It doesn’t look like ALIAS will be flying 737s for Delta or the other commercial airlines. This is pretty much a military thing. But it’s still pretty cool nonetheless.